Quantum's Smoke PT Baitcast Reels are lightest all-aluminum reels in their class, built strong and responsive and ready for full days on the water. All critical components have been lightened, yet the strength and durability you count on remains intact. Smoke PT Reels are Performance Tuned to ensure smooth operation at every turn, with a premium aluminum frame and sidecovers, ACS cast control system, ceramic PT drag system, permanent Hot Sauce lubrication, lightweight EVA handle knobs, and an aluminum main gear and driveshaft. "This reel is great. I own 20+ Quantum reels dating back 15 years. This is the best. My first trip with it was to Lake Amistad, TX in the sping. Lots of 4 to 6 lb bass. This reel performed flawlessly. " "This reel is the lightest reel I have held in my life. It is very comfortable and is way worth the price. I paired it up with the bionic blade. By far this is the best reel I have ever used and is really smoothe. " 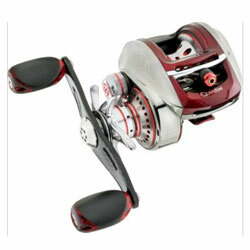 "ive had other reels before i bought this reelnow its all i want to use. well worth the money. loved it so much that i went out and bought another smoke rod and reel. "